The Purple Martin is the largest North American swallow. The breeding habitat is open areas across eastern North America and some locations on the west coast from British Columbia to Mexico. Martins make their nest in natural or artificial cavities. In the east where Purple Martins are almost entirely dependent on such structures, humans put up real or artificial hollow gourds or houses. As a result this subspecies mostly breeds in colonies located in proximity to people including cities and towns. 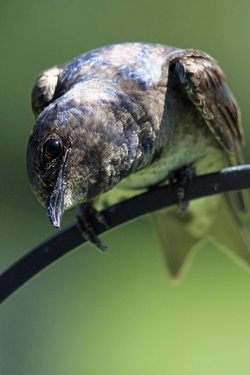 The Purple Martin not only gets all its food in flight, it gets all its water that way too. Why not become a Purple Martin Landlord today! Click on Purple Martin to view more images.